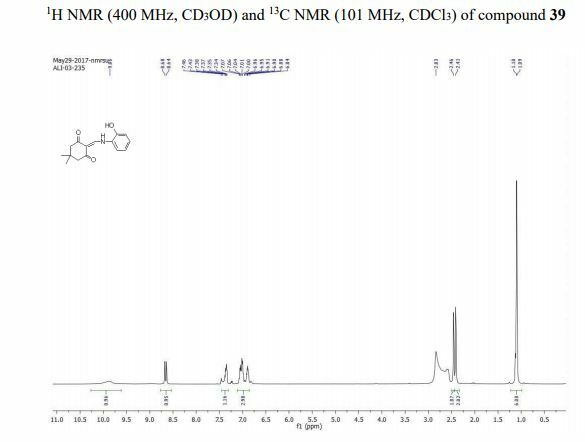 13C NMR (101 MHz, CDCl3) δ 199.8, 197.2, 149.6, 149.3, 147.8, 127.2, 126.6, 120.6, 120.3, 108. The present study utilised whole cell based phenotypic screening of thousands of diverse small molecules against Mycobacterium tuberculosis H37Rv (M. tuberculosis) and identified the cyclohexane-1,3-dione-based structures 5 and 6 as hits. 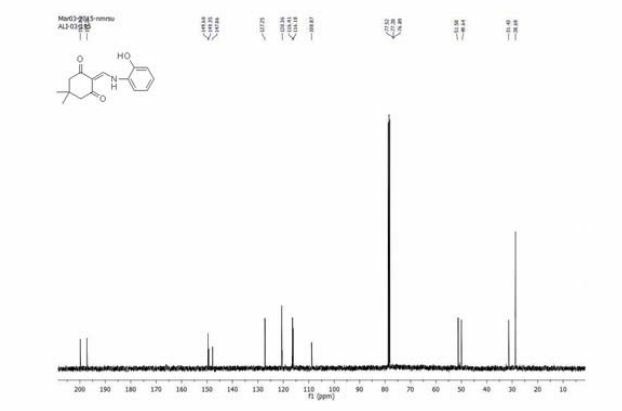 The selected hit molecules were used for further synthesis and a library of 37 compounds under four families was synthesized for lead generation. Evaluation of the library against M. tuberculosis lead to the identification of three lead antituberculosis agents (37, 39 and 41). The most potential compound, 2-(((2-hydroxyphenyl)amino)methylene)-5,5-dimethylcyclohexane-1,3-dione (39) showed an MIC of 2.5 μg mL−1, which falls in the range of MICs values found for the known antituberculosis drugs ethambutol, streptomycin and levofloxacin. Additionally, this compound proved to be non-toxic (<20% inhibition at 50 μM concentration) against four human cell lines. Like first line antituberculosis drugs (isoniazid, rifampicin and pyrazinamide) this compound lacks activity against general Gram positive and Gram negative bacteria and even against M. smegmatis; thereby reflecting its highly specific antituberculosis activity.